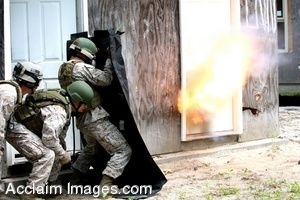 Description: Clip art photograph of marines with Marine Special Operations Advisor Group (MSOAG) initial training pipeline are stacked in front of a door while a charge explodes during the Demolition and Logistics Subject Matter Expert Track on May 21, 2008. During the Demolition and Logistics Subject Matter Expert Track, the Marines of MSOAG initial training pipeline learn the ins and outs of demolition from the mathematical formulas to properly creating an explosive device. (U.S. Marine Corps photo by, Lance Cpl. Michael J. Ayotte, MCB Camp Lejeune COMCAM). Clipart photograph by Department of Defense Public Domain.